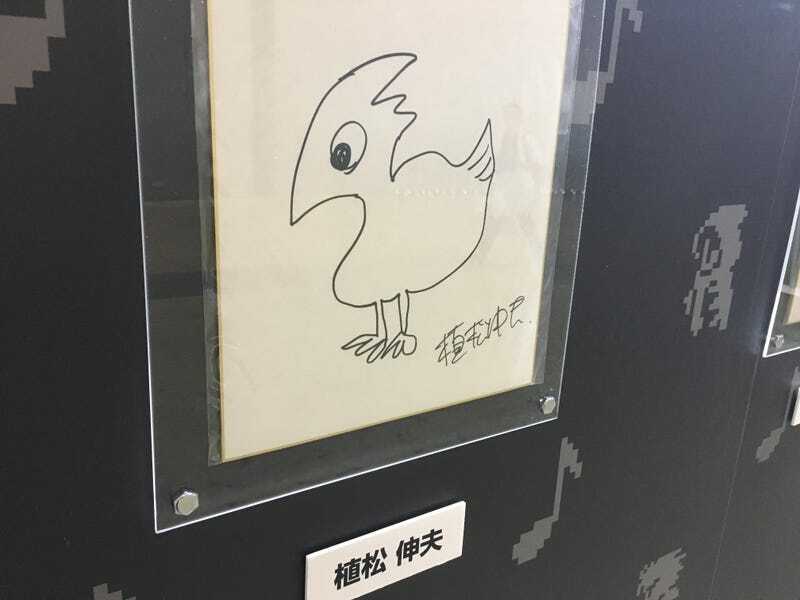 At the Square Enix Music booth at this year’s Tokyo Game Show, there’s a display of original Chocobo artwork done by the creators of various Final Fantasy games. Some of these creators aren’t visual artists by trade, so the results are a little interesting. Here’s Kazuko Shibuya’s take. A pixel artist par excellence, Shibuya did the original dot characters for the NES and SNES games, as well as the nitoushin “chibi” characters seen on the Japanese box for Final Fantasy IV and V. Accordingly, here’s Chocobo with one of Shibuya’s most well-known creations, the adorable Black Mage. Yoshitaka Amano, the image illustrator of the series since its beginning, turns in a lovely sketch in his signature style with an added Moogle. Here’s a weird glasses-and-barrel take on Chocobo from Koichi Ishii, creator of the Mana series. Crystal Chronicles designer Toshiyuki Itahana seems to have spent the most time on his. However, I think he’s lost the essential “chocobo-ness” of the image by having the Black Mage, Moogle, and crystal draw the viewer’s eye away from the hero. 7/10. Finally, here’s a sumi-e style quadtych from the daddy of Final Fantasy himself, Hironobu Sakaguchi. Like Uematsu’s drawing, there’s something elegant about this non-professional artist’s attempt here. Feels like a Beatles album cover.